This work is inspired by "Ko-tsu-no-bo-se (meaning: placing bone on)", which is the buddhism custom in Mount Koya and its outskirts. "Ko-tsu-no-bo-se" means to lay a decedent's bone, hair, or nail to rest in a temple named Kongobu-ji in Mount Koya as a memorial service for him or her. The title being used, "Sumeru", is considered to be the center of all the physical, metaphysical and spiritual universes in ancient Indian cosmology. Mount Koya, which is a sacred place in Shingon Buddhism, is like that Sumeru for believers of Shingon Buddhism. 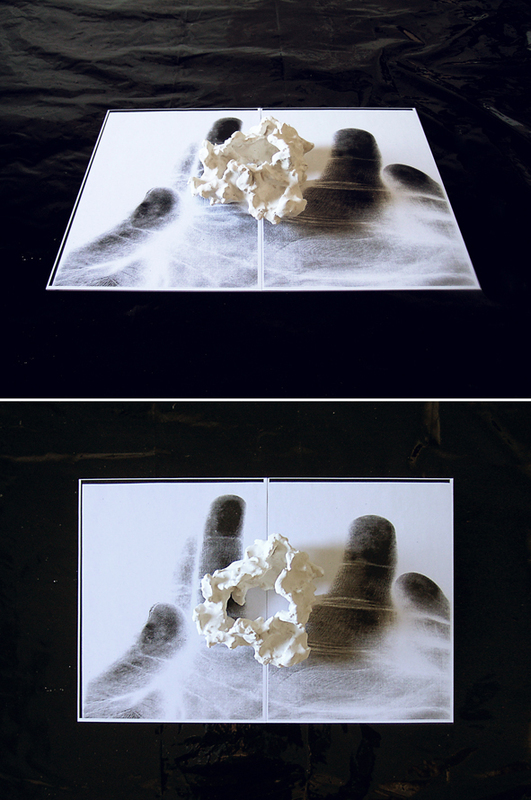 There are two parts in this work, one is the xerox copied image, in which I enlarged and deformed my hand to look like a landscape. And the other is an abstract object formed by clay and colored by plaster. The image of this object, which resembles bone or plant-life, may come out of the representation of the soil's (clay's) materiality itself.